Michigan Republicans Flat Out Lying on Tax Cut Talk, It’s a Tax Increase! Here’s the Magician’s in the Republican controlled legislature with their slight of hand tricks selling a bad bill of goods and spinning the truth to the citizens. In 2007, in response to budget deficits, the personal income tax rate was increased to 4.35%, with a scheduled phase-out of 0.1% annually until October 2014, when the rate would have reached 3.9%. Now one Republican Senator wants to extend the 4.35% rate out to 2018. In 2011, as part of a major state tax shift that reduced business taxes by 83%, while increasing personal income taxes by eliminating a range of tax credits and deductions, the personal income tax rate was maintained at 4.35%, with a rate reduction to 4.25% in January of this year. 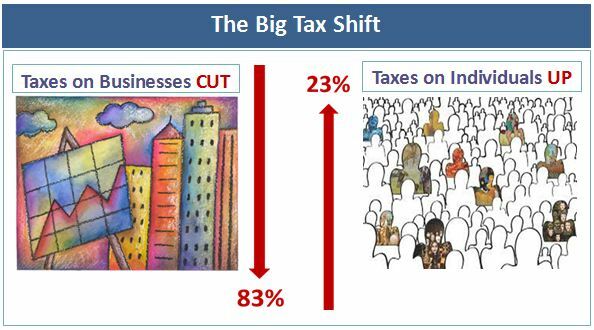 The net effect of the 2011 legislation was a state tax cut of $550 million annually, along with a shift in tax responsibility from businesses to lower- and middle-income families and retirees. When Snyder took office in 2011, however, he and fellow Republicans offset their $1.6 billion business tax cut with a $1.4 billion increase on individuals, which included taxing retirement income and not letting the income tax rate drop as much as planned. 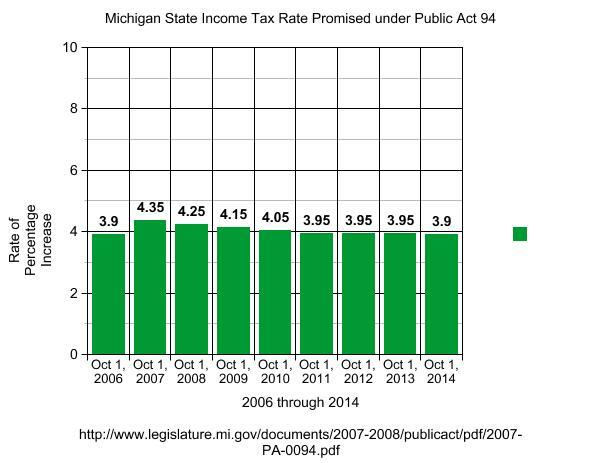 Sen. Brandenburg Voted “NO” as a State Rep. while in the House in 2007 now he wants to extend this higher tax rate on the citizens of Michigan till 2018. “That was a promise we made to people in ’07. I think that promise should be honored,” said Sen. Jack Brandenburg, a Republican from Macomb County’s Harrison Township. He plans to introduce tax cut legislation in the Finance Committee he chairs in January. The bills will call for dropping the rate a tenth of a percentage point each year starting in 2015 until it hits 3.9 percent in 2018.